We caught up with some incredible acts that performed at China Night and Taiwan Beats during SXSW 2019. Find out about three of our favorites below: Elephant Gym, LIA LIA, and The Upside Down! We wish we skipped out on midterms to catch Elephant Gym live at the Middle East in early March. Luckily, however, we were able to see them live at the Taiwan Beats showcase. Honed in the vibrant DIY scene of Kaohsiung, the band’s got incredible stage presence, feeling their own music so hard that the audience can’t help but feel it too. Their slick brand of math rock is at once headbanging and bootyshaking. 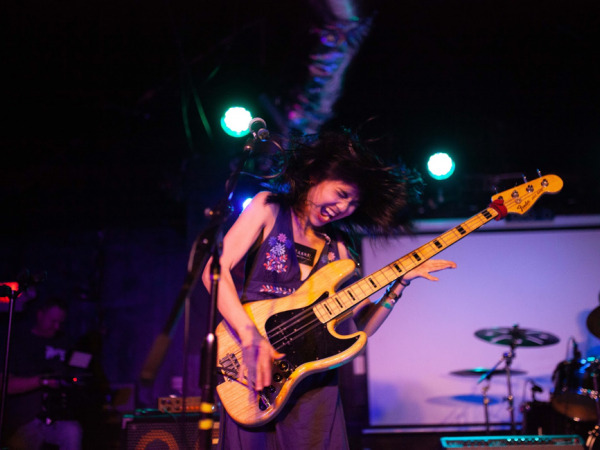 With KT Chang laying down the groovy foundation on bass, Chia-Chin Tu constructing the funky scaffolding on drums, and Tell Chang filling out the walls on guitar, the trio are veritable architects of math rock jams. They’ve all graduated from university and are now pursuing music full time, having just released their new album Underwater in December. “We’re now trying to earn money from our band,” says Katie, the bassist. And after playing a show almost every day after arriving in Austin, it seems their efforts are paying off. When not rushing to and from sound check, the band catches up with friends in the US and likes to go shopping. “I always buy clothes during our world tours. I’ve been to vintage clothing stores in Boston, Austin, and New York. It’s so exciting!” says Katie. At the end of the day, however, their hometown of Kaohsiung tops any list. At the Taiwan Beats press conference, they cheer in unison when the city is mentioned. Despite the best efforts of the Boston crowd to be “reqing”, meaning welcoming, nothing beats the balmy weather of southern Taiwan, perfect for eating mango shaved ice or hei tang gao, their favorite desserts. Nevertheless, we hope we’ll get to see them in Boston again soon! LIA LIA is a plant, photosynthesizing everything from “the internet, animation, [her] girlfriends, strangers in the metro, movies, and those mysterious Chinese fox women from the ancient fairytales” and transforming that inspiration into slickly-produced experimental pop earworms. We’re glad we caught her only set at SXSW this year during China Night at Elysium, where she transformed the stage with wispy, wistful vocals and a dreamlike stage presence. Her songwriting process matches the otherworldly and cinematic nature of her performance: “Most of the time when I write, I have a movie in my head and just try to describe the situation and my feelings to a stranger. The production is the whole soundtrack to it,” she tells us. True to her nature, she’s recently been listening to Mother Earth’s Plantasia by Mort Garson, taking in and growing from the relaxing synths and whimsical melodies. Having lived in Berlin, Chengdu, LA, Buenos Aires, and Cologne, the young singer-songwriter has worldly experience that belies her age. LIA LIA true potential, and we’re excited to see what’s in store for her in the future. Certainly, The Upside Down are a part of that movement; taking the stage in Austin, they slowly grew into their roles as performers and had the crowd moving and grooving by the end of their set. “We were very surprised at first when we got the invitation to perform at SXSW. We’re a small band that has been together for less than three years. Before our performance we were a bit nervous, but once we stood on the stage we suddenly relaxed and were able to enjoy our own performance,” the band added. James Gui is a DJ for the Record Hospital and The Darker Side. His RH show airs every Wednesday night from 11pm-12am, and his TDS show airs alternating Saturdays from 9pm-10pm.